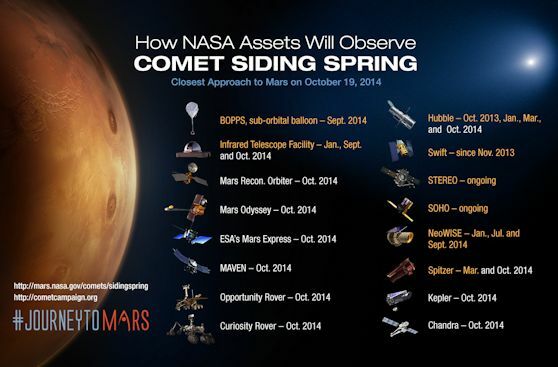 Oct. 9, 2014: NASA’s extensive fleet of science assets, particularly those orbiting and roving Mars, have front row seats to image and study a once-in-a-lifetime comet flyby on Sunday, Oct. 19. Comet C/2013 A1, also known as comet Siding Spring, will pass within about 87,000 miles (139,500 kilometers) of the Red Planet -- less than half the distance between Earth and our moon and less than one-tenth the distance of any known comet flyby of Earth. Siding Spring’s nucleus will come closest to Mars around 2:27 p.m. EDT, hurtling at about 126,000 mph (56 kilometers per second). This proximity will provide an unprecedented opportunity for researchers to gather data on both the comet and its effect on the Martian atmosphere. Siding Spring came from the Oort Cloud, a spherical region of space surrounding our sun and occupying space at a distance between 5,000 and 100,000 astronomical units. It is a giant swarm of icy objects believed to be material left over from the formation of the solar system. Siding Spring will be the first comet from the Oort Cloud to be studied up close by spacecraft, giving scientists an invaluable opportunity to learn more about the materials, including water and carbon compounds, that existed during the formation of the solar system 4.6 billion years ago. Some of the best and most revealing images and science data will come from assets orbiting and roving the surface of Mars. In preparation for the comet flyby, NASA maneuvered its Mars Odyssey orbiter, Mars Reconnaissance Orbiter (MRO), and the newest member of the Mars fleet, Mars Atmosphere and Volatile EvolutioN (MAVEN), in order to reduce the risk of impact with high-velocity dust particles coming off the comet. The period of greatest risk to orbiting spacecraft will start about 90 minutes after the closest approach of the comet's nucleus and will last about 20 minutes, when Mars will come closest to the center of the widening trail of dust flying from the comet’s nucleus. "The hazard is not an impact of the comet nucleus itself, but the trail of debris coming from it. Using constraints provided by Earth-based observations, the modeling results indicate that the hazard is not as great as first anticipated. 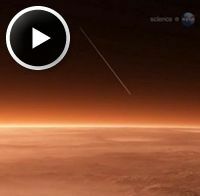 Mars will be right at the edge of the debris cloud, so it might encounter some of the particles -- or it might not," said Rich Zurek, chief scientist for the Mars Exploration Program at NASA's Jet Propulsion Laboratory (JPL) in Pasadena, California. The atmosphere of Mars, though much thinner that Earth's, will shield NASA Mars rovers Opportunity and Curiosity from comet dust, if any reaches the planet. Both rovers are scheduled to make observations of the comet. NASA’s Mars orbiters will gather information before, during and after the flyby about the size, rotation and activity of the comet's nucleus, the variability and gas composition of the coma around the nucleus, and the size and distribution of dust particles in the comet's tail. Observations of the Martian atmosphere are designed to check for possible meteor trails, changes in distribution of neutral and charged particles, and effects of the comet on air temperature and clouds. MAVEN will have a particularly good opportunity to study the comet, and how its tenuous atmosphere, or coma, interacts with Mars' upper atmosphere.